This compact wine cabinet is a stylish accent for your dining or living space. Made of sheesham solid wood, it offers a natural and organic feel with its prominent wood grain. The slats and metal frame of the wine rack offer a simple way to put your wine bottles on display. 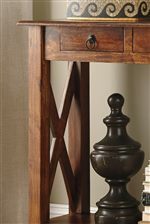 The Abbonto Sheesham Solid Wood Wine Cabinet by Signature Design by Ashley at Godby Home Furnishings in the Noblesville, Carmel, Avon, Indianapolis, Indiana area. Product availability may vary. Contact us for the most current availability on this product. The Abbonto collection is a great option if you are looking for Casual furniture in the Noblesville, Carmel, Avon, Indianapolis, Indiana area. Browse other items in the Abbonto collection from Godby Home Furnishings in the Noblesville, Carmel, Avon, Indianapolis, Indiana area.